The Ultimate Coconut Grater came in handy for making the following dish. 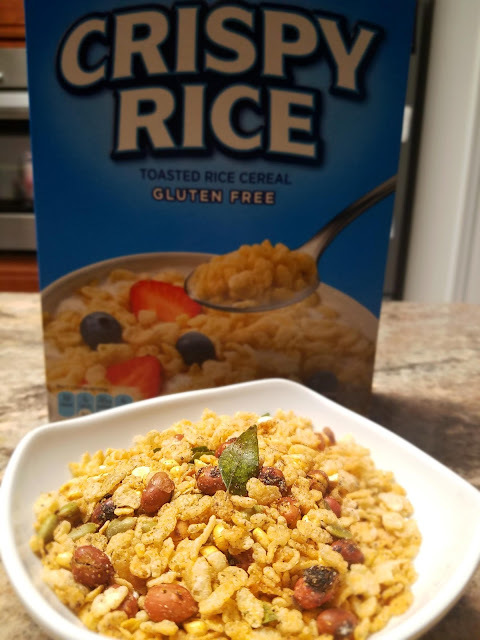 My mom likes adding shredding coconut for added flavor. It's called Kheer or (Payasam in Telugu). It is a traditional South Asian dessert, made by boiling rice or broken wheat with milk and sugar, and flavored with cardamom, raisins, saffron, pistachios or almonds. 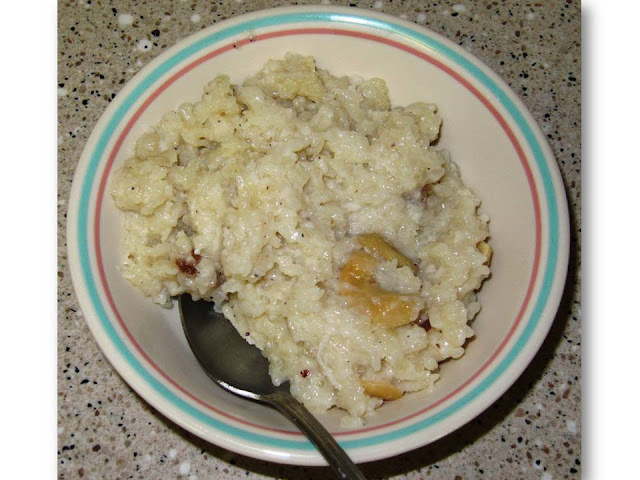 (http://en.wikipedia.org/wiki/Kheer). 1) Cook rice either in a rice cooker or stove top using 1-1/2 cups of water and 1 cup of milk. 2a) Transfer the cooked rice into a non-stick sauce pan and add remaining milk, shredded coconut, sugar & brown sugar, cardamom powder and the bay leaves. 2b)Cook on low-medium heat for 10 – 15 minutes until the mixture is thick and cooks well. Add water or milk if needed if the mixture is too thick. Remove from stove. 3) Melt butter and fry the cashew nuts until golden brown and add raisins and mix well. Transfer the contents into the pudding. Serve either hot or cold. - If you have some leftover rice, using it to make kheer from step-2 on wards is a good way to turn it into a hearty and healthy dish. And if you are worried about sugar calories, use a sweetener instead and adjust the measurements. - Also for a rich texture and taste, whole milk can be used or evaporated milk can be added instead of water. 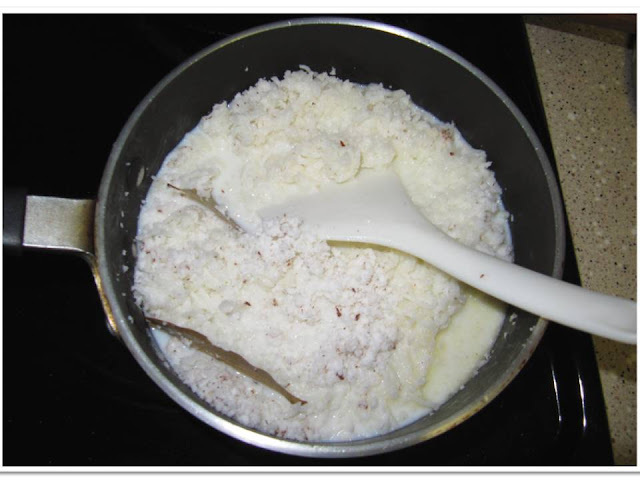 Two tablespoons of condensed milk can also be used before removing from heat when the pudding is cooked with 1% milk, but reduce the sugar quantity accordingly. - Not everyone is too keen on buying whole coconuts and figuring out how to grate the flesh inside. Freshly grated coconut is available in the freezer section in most Indian grocers such as Patel Borthers or Subji Mandi. Wow, this looks so nice and I just love kheer (specially after a night in the fridge). Question: Are those two bay leaves in the 1st picture. What are they for? 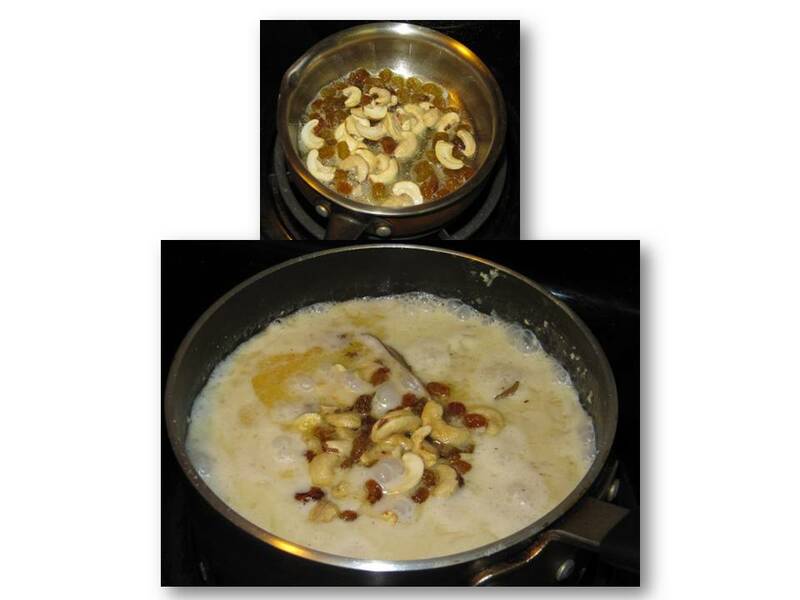 The bay leaves were used to elevate the flavor of the Kheer.